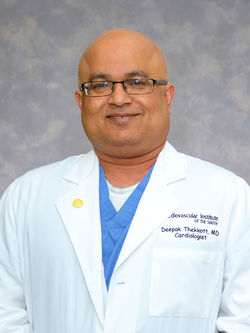 Dr. Deepak Thekkoott, an interventional cardiologist at Cardiovascular Institute of the South, was the first to use a new side branch stent to treat coronary artery disease at Lane Regional Medical Center. This flexible new stent technology is specially designed to fit the shape of a blocked main heart artery that also has a blockage located in the side branch of the heart. It is delivered to the artery via a balloon catheter and is used in conjunction with a conventional drug-eluding stent implanted in the main vessel. Stenting of the main branch is the current standard of care, but in many cases the side branch is not stented leaving it vulnerable to future blockages and emergency stent placement. Coronary artery disease, the leading cause of death in the U.S. in both men and women, often results in the buildup of plaque at a site where one artery branches from another, also known as a bifurcation. Approximately 20-30% of patients have a bifurcation lesion. To schedule an appointment at Cardiovascular Institute of the South in Zachary, please call 225-654-1559.